The Model 2711A is your low-cost, bundled solution for Very High Fidelity, (0.005% distortion) waveform creation for frequencies less than 1MHz. 10 standard waveforms and up to 100 user-defined waveforms allow the unit to operate as a function generator direct from the keypad. Create complex waveforms using WaveWorks Jr. software, which is included with the 2711A at no additional charge. RS232, GPIB and multi phase mode are also included. 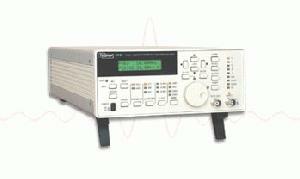 The model 2711A is suited for high fidelity, low cost signal generator applications that need quality performance.